Draft Profile: Will Luka Doncic Take The NBA By Storm? 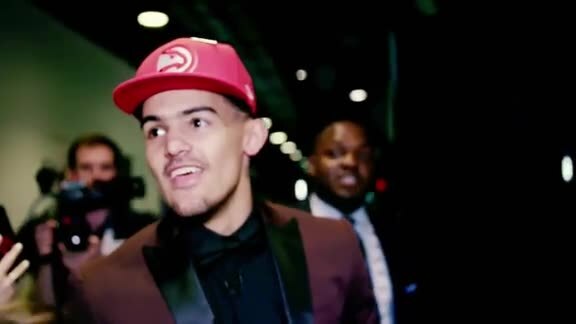 The Hawks hold the rights to the #3, #19, #30 and #34 picks in the upcoming June 21 NBA Draft. At Hawks.com, we'll be talking to some of the writers and bloggers who watched some of this year's key prospects most closely. Today we talk to Austin Green (@LosCrossovers) of the EuroLeague Adventures podcast about pick-and-roll prodigy Luka Doncic of Real Madrid. What does Luka do well? Luka is an incredibly good passer and pick-and-roll playmaker with a high basketball IQ. His feel for the game is amazing. He understands timing and angles on an instinctive level that you often don't see from 10-year NBA vets, let alone a teenager. He has the creative mind of someone like Manu Ginobili, but in a 6-foot-8, 230-pound body. He is a versatile scorer who can shoot threes, convert floaters and mid-range jumpers and score in the post. He is great at grabbing defensive rebounds and pushing the ball up in transition, looking to feed teammates, hit pull-up threes or attack the basket if defenders don't stop his momentum. He's a better athlete than he gets credit for, and he's a smart defender who makes the right rotations and isn't afraid to challenge shots at the rim. Perhaps most importantly, he is poised and confident in big moments. He will enter the NBA with about 200 professional games behind him, including championships at every level in Europe with his club Real Madrid and the Slovenian national team. He has been put in many pressure-filled situations throughout his young career, and he has usually delivered. When he does face adversity, he has consistently shown that he can overcome it by learning and improving from his struggles. How does his game translate to the NBA? His game will translate very well. The NBA is a fast-paced, pick-and-roll, three-point shooting league, and that suits Luka's style perfectly. He is a fantastic pick-and-roll player who is great at finding shooters at the three-point line and big men rolling to the rim. He can see over the top of defenses at 6-foot-8, and he's strong enough to throw passes that most perimeter players simply can't. Only elite-level guys like LeBron James, James Harden and Ben Simmons can make the type of passes that you'll see Luka make on a regular basis. He's also a versatile player who can play multiple positions. If you want him to bring the ball up-court and initiate the offense, he can do that. If you want him to play off ball and spot up for threes or run off screens, he can do that. If you want him to post up, he can do that. He will find a way to fit with just about any players you pair him with. Luka's biggest weakness right now is his lateral quickness. He will struggle to stay in front of most NBA point guards and the quicker wings. He'll get burned at times, but I think he's smart enough and athletic enough to eventually become a decent NBA defender. He'll probably never be great, but he won't be horrible either. On the offensive end, he sometimes struggles to beat guys off the dribble. He often tries to do too many moves, crossing over two or three or four times when he should just make one quick move and pull-up or pass the ball. He had a ton of creative responsibility for Real Madrid, and he often had to create something out of nothing late in the shot clock. Sometimes the results were ugly. I think if he improves his diet, improves his conditioning and gets a little more explosive, he can improve on these weaknesses. What style of play suits his game best? Luka likes to get up and down the court and play kind of a free-flowing game. He is great at attacking moving defenses, both in transition and in the half-court. I think the best situation for him is a fast-paced team with a quick point guard already in place. Luka is at his best as a secondary creator, with another PG (like Goran Dragic with Slovenia) initiating the offense. That gets the defense moving, and Luka is elite at picking apart a moving defense. When the starting PG sits, Luka can slide over to the primary ball-handler spot, and if he gets the defensive rebound, he should be pushing it up in transition regardless of who else is on the court. To which current or past NBA player would you compare him? His body reminds me of Joe Johnson or Paul Pierce -- 6-foot-8, strong, great skills and timing and footwork, but not particularly explosive. And like I said, he has the creative and savvy mind of someone like Manu Ginobili.